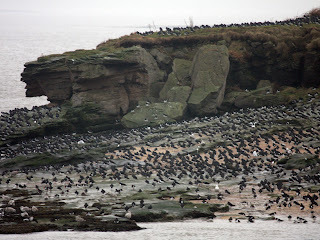 Today was my first opportunity this year to get across to Hilbre Island. This is one of the jewels in the crown of my local patch, always gets you something good! This jewel was not so shiny today, draped in grey mist when the snow stopped! The grey persisted all day. At times the horizon was lost to the grey drizzle, no dividing line between sky and sea. Birds were great though. A few crackers for the list. Over tide visits are the best! Across the sands early to set up some time-lapse photography kit for a tide-coming in and going out again sequence for a slide show that I'm developing. Once the kit was up & running I was able to catch up with some Hilbre winter specials. I was hoping for some divers and grebes off shore, maybe a Scoter or two plus waders and geese around the island. Purple Sandpipers are one of my favourite waders. 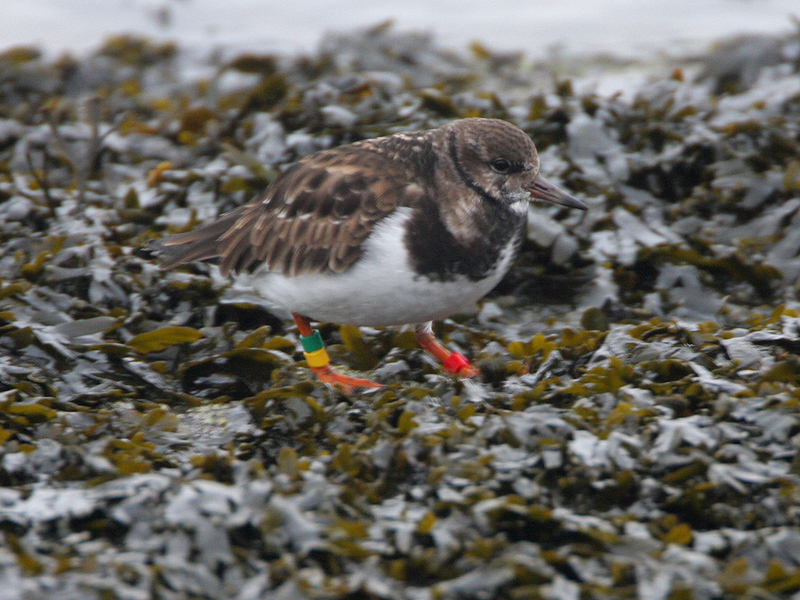 It seems like a treat to me whenever you catch up with one of these diminutive, dumpy little shorebirds as they are winter visitors to rocky shores and are seldom encountered away from this habitat. Great close views of 6 roosing birds by the lifeboat slip over high water and up to 8 feeding as the water dropped. Wandering down towards the southern tip of the island I encountered two Grey Plovers, aptly named for the island today! Fumbling with cameras and lenses to try and get a shot of them and on looking up - gone! Winging out over the waves to disappear into the mist! Carry on along the path and discover that where I missed a Peregrine didn't. Just the wings and a couple of feathers remain of one of their counterparts. Looking over to Middle Eye I'm amazed by the number of birds roosting there. The island is almost groaning under the weight of them! 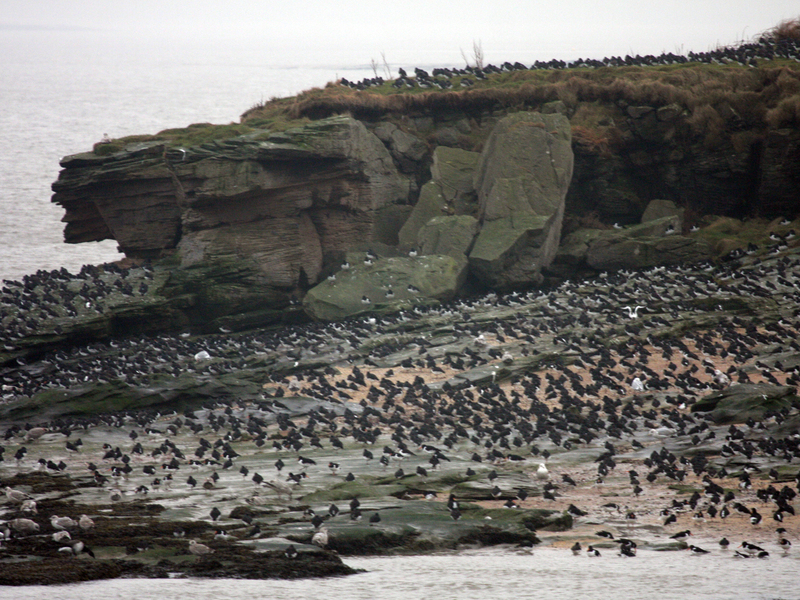 Thousands of Oystercatcher, hundreds of Curlew and dozens of my new quarry, Brent Geese. 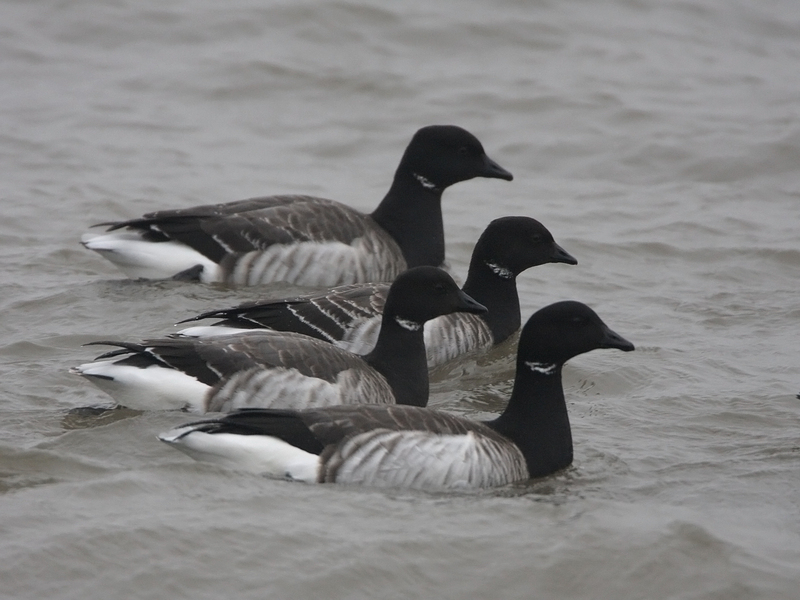 Another Hilbre winter special the Brent Goose. Over high water they tend to move over to West Kirby, but there are still a couple of dozen grazing on the seaweed at the edge of the surf. Small parties break away and drift off up the island allowing close views and a few photographs. They also go past one of the 3 cameras we have set up on the time-lapse project. A check that all is well with the time-lapse and back up to the Lifeboat Slip. Camera away, check up on the Purps - still roosting away. Scope out and look out to sea. 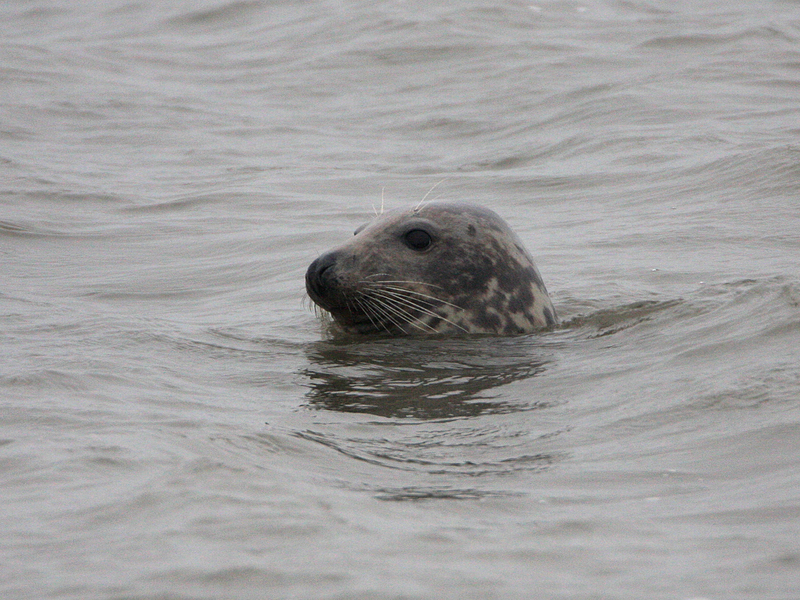 Hilbre is the best seawatching point on my patch and didn't disappoint today. Great-crested Grebes spotted straight away. 9 coming and going from view on the chop of the water. Grey dart across the scope view, follow it, it's really shifting! Pointy wings, silvery grey (colour theme continues), a neck that droops, yes, it's a Red-throated Diver! Bonus, thought I might struggle in the murk. Eye jammed to the scope but feel I'm under observation too. No surprise I am being watched by a Grey Seal. Several have been circling the island, keeping tabs on our movements. A couple of Common Scoter floating past complete my seawatch. Tide is starting to drop now and the seaweed is becoming exposed. 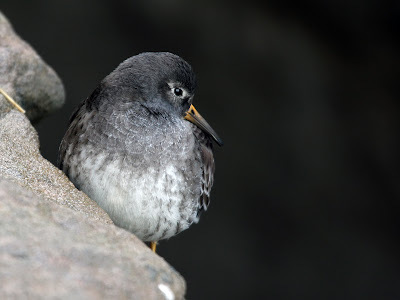 This brings the Turnstones and Purps out from roosting nooks and crannies, their eroded shelves in the sandstone cliffs (a Rock Pipit drops in to be another new bird for the 2011 list). Awesome camoflauge on these guys, they vanish into the curly seaweed mass to appear yards further down the shore. I notice one is colour ringed. The guys from the Hilbre Bird Obs have been ringing Turnstone here for a while. I recognise another from my morning calls at the Marine Lake. Eventually one runs close enough to get a clear shot. It takes a while to get the picture as the birds zip along tossing weed aside in the search for food. This movement is picked up by the camera as shutter speeds are slow due to the relentless greyness of the sky, sea, rocks. Plenty of blurred shots before I get a keeper. Soon the tide has fallen enough for us to start to head home, we are chilled to the bone but happy with a wicked day on the island! The list is looking healthier too!